Photo by Gabrielle de Vietri. Click on photo for larger image. Now, here’s something to keep scoreboard attendants on their toes: a three-team game of footy. It was played on Saturday 5 October just outside of Horsham, and went very well. The game had eight players per side, 35 metre lines instead of 50 metres lines and was played over three 20 minute thirds. The photo above was the score at the end of the third third. 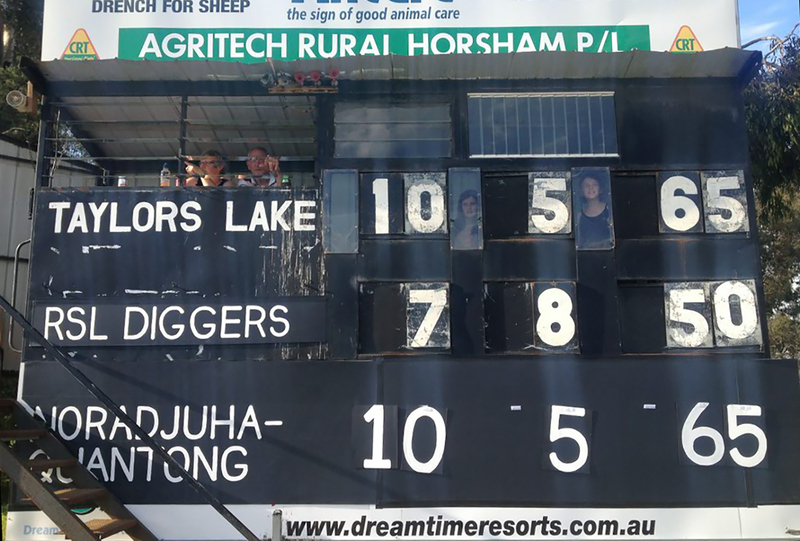 Extra time was played, in which Horsham RSL Diggers scored another goal (to finish 8.8 56) and then Taylors Lake goaled to win the game 11.5 71. The game was devised by conceptual artist Gabreille de Vietri, and has been short-listed for the $100,000 Basil Sellers Sports Art Prize.